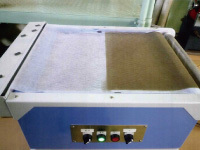 For factories, the work place we need concern about health hazard by dust. Collect dust in the air with powerful fan and remove it by filter. 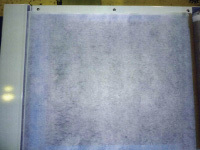 If a filter couldn't trap particulates, water shower in the device absorb them. Also cooling effect by shower is promising. 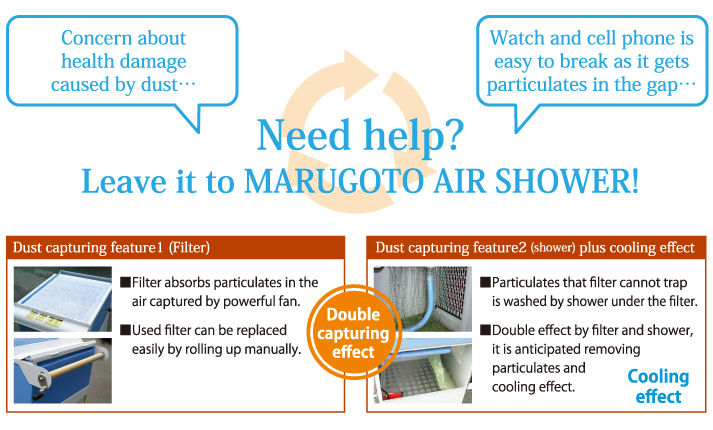 MARUGOTO AIR SHOWER draws in particulates and dirty air is purified by filter and shower and then sent back into the room as clean air. Potable with wheels so that you can take it anywhere you want. MARUGOTO AIR SHOWER is widely used various places where is likely to happen air pollution. 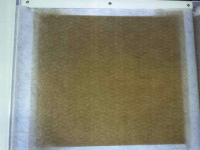 After the test started, it hasn't captured dust very much and is still white. The filter caught a lot of dirt yet you can see the screen under the filter. The filter has full of dirt. It gets darker and even take a closer look, the screen is not visible anymore. 7 hours later, the test finished. Rolling up the filter....you can see it at a glance! 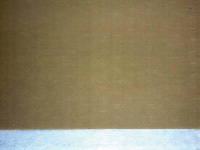 This is how much air is polluted by dirt. 50Hz or 60 Hz.It would make a difference in power consumption or air volume.